Description - Our Eco-Lock rubber tiles are available with detachable border pieces so that each tile can work as a border, corner, or center tile. These tiles are die cut and available in 10 color options. Each 8mm Eco-Lock gym tile is backed by a 5 year warranty, For the lowest cost commercial grade gym tile, look no further!!! Weight – 1/4" ~ 5.2 lbs, 8mm tile ~ 8 Lbs. Recommended Uses – Eco-Lock rubber tiles have been used successfully as flooring for home gyms, in commercial weight rooms, in dog kennel facilities, as ski lodge flooring, in locker rooms and baseball dug outs, as golf course club house flooring, over radiant heated floors, in basements, as boat house flooring, in outdoor storage sheds, and in a variety of other places where an anti slip flooring with shock absorbing properties would be beneficial. Available in 1/4" and 8mm options. Available in 10 quick ship colors. Detachable border pieces allow each tile to be a corner, border, or center tile. High quality die cut tile made in the USA. I want to use this product in an enclosed trailer, can these tiles be glued to the wood flooring? Our Eco-Lock Rubber Tiles can be glued to a wood floor. The glue you will want to use is our Polyurethane Glue. This glue ensures a tight bond between the rubber flooring and the wood flooring. I will be installing this floor on a below-grade (basement) concrete slab. Is any sort if underlayment recommended? If so, what type? For our Eco-Lock Rubber Tiles, and underlayment is not required. You can add an underlay if you like. You can use rubber underlayment, foam underlayment, or cork underlay. If you are ordering say 20 tiles does each tile come with edge pieces or do you have to cut each one? Every Eco-Lock Rubber Tile comes with two removable edge piece. I want to use these for an outdoor (uncovered) gym floor on my patio. I live in a very moderate climate with no snow and little rain. Will these be ok for this use? You can install our Eco-Lock Rubber Tiles outdoors. These tiles are resistant to mold and mildew growth and are very easy to clean and maintain. Since these tiles are not UV stable, they will fade in direct sunlight over time. Will these work as well for gym flooring in terms of heavy compound lifting, traction, etc, as normal rubber flooring? 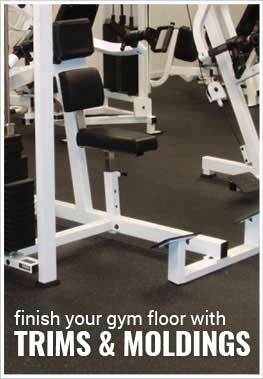 Our Eco-Lock Rubber Tiles have been installed in both commercial and home gyms. These tiles are very durable and can withstand any normal lifting exercises. I recently decided to upgrade my home work gym. As i researched multiple options which included trips to Home Depot and Loews, I found this company on line. The square footage estimator was the first thing that caught my attention. It immediately helped me put an accurate cost on the project. The multiple tile options that they offer sealed the deal for me. The product arrived promptly and was very easy to install, with no wasted product which I appreciated. I was concerned that the tiles might not stay together with traffic. They not only stay together well, but it is almost impossible to see where the tiles are joined. It looks like a solid mat. Very happy with this purchase and this company. Once in place and interlocked, the tile joints are practically invisible. Only complaint is the lingering aroma of fresh rubber, more appropriate for an automobile showroom than a residential living/working space. Hoping the the volatiles will soon be done out-gassing, leaving the room odor-free. Bought 15 of the Eco=lock rubber tiles to make a 6'x10' protected space over my tile floor where I could set up an indoor workshop and not worry about dropping tools and have them chip the tile floor. The rubber tiles are perfect for the application I needed. I ordered the tan flecked tiles to sort-of fit in with the tan (wood-tone) tiles. Installation was a breeze, took only about half an hour. Only had to cut one small piece of one of the outer edge pieces to complete the fit. Only downside is that the rubber tiles are fairly expensive, but that's a cost I was willing to accept. I am not/not sure whether over time any of the petroleum/oil in the rubber will leach into my tile grout and discolor it, but I guess I will find out in a year or two. These tiles are great to work and easy to cut only had to cut one wall and we had to cut strip with no lock tabs at your doorway but edges stick and looked good will glue those pieces if they move but so far the floor is flat and feels good unfoot instead of bare cement. I highly recommend these for any floor you need durable and protected they can be taking up and hosed or just washed anytime to.